Figure: Bukschieten is a shooting sport with a traditional character. Often played with traditional costumes, Also known in certain regions within the Netherlands. Figure: The balls (krulbollen) are only half the size of the normal bolls. As well they are flatter. Figure: blocks at the end of a sloping alley have to be knocked down by bowls. 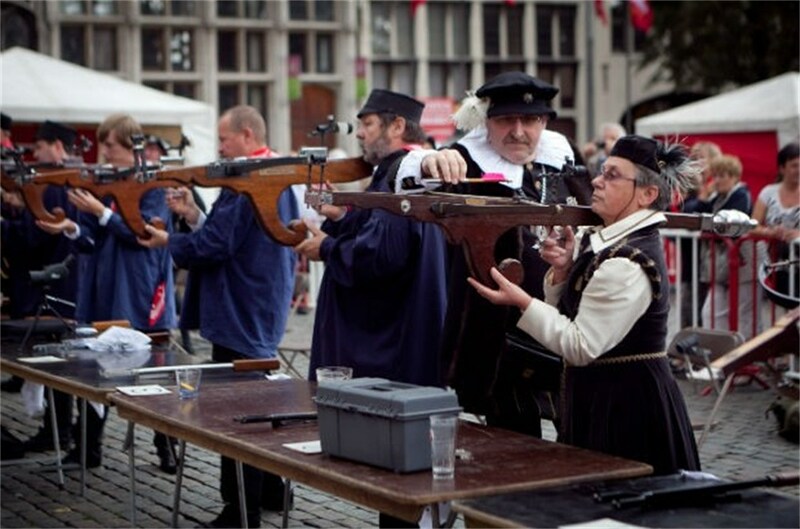 Figure: The muskets keep shooting competitions in traditional costumes. Also famous in Germany, the Netherlands, and Austria. Figure: player tries to hit the ball with his palm, popular in Wallonia (balle pelote), but different from Fries kaatsen (The Netherlands). Figure: man and woman stretching the catapult, a small hand-powered projectile weapon. Figure: A woman tries to throw the skittles down with a ball. The games is usually played with nine skittles. The alley differs from region to region. Figure: The shooter points with a carabine diagonally upon a target (size of a 2 euro coin). Figure: A ball game played between two teams of four players. Figure: A lady who rolls the round. Figure: A boy shooting at the horizontal rake. Figure: A row of horizontal rakes. Figure: a man throws a disk to a pole (the 'paap') from 8 meters. Figure: The materials for 'paapgooien' are some disks , a pole (the 'paap'), and coins. Figure: Longbow archery vertical pole. Figure: Trabol is played on a long hollow lane of 18 meter.